Air conditioned machinery is no longer considered a luxury but instead a necessity due to the long work days and dusty conditions that are part of farming. 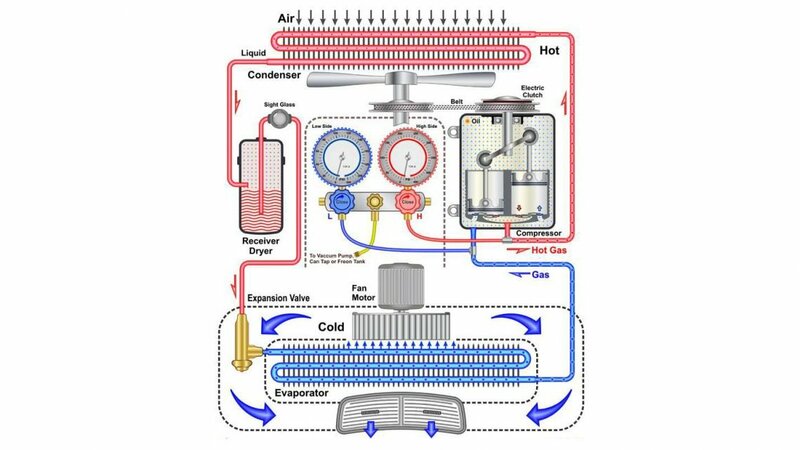 The system consists of a compressor, hoses, evaporator (in the cab), condenser (in front of radiator), system drier, flow valves, and a refrigerant (R-12, R-134a). Mixed in with the refrigerant is a special oil that keeps the moving parts in the compressor lubricated. There are also two refrigerant pressure pathways; low side and high side. The system low side (larger hoses/lines) has the refrigerant in a gaseous state while it is a liquid on the high side (smaller hoses/lines). There are Schrader valve ports on both the low and high side. They are used to check pressure and for service. Common knowledge is to keep the condenser free of debris, change the cabin filter (if equipped) and to maintain drive belt tension, but the Farm Machinery Digest wants to bring you to a higher level of understanding. A/C system operating pressure is directly linked to the thermal load (in cab temperature) but more importantly, the ambient and under hood temperature of the equipment. A hot day with the engine working hard will significantly raise the high side pressure. For this reason there is usually a safety blow-off valve integrated into the design. A properly maintained and operating system will never evoke the blow-off but it is a potential leak area. A/C system pressure is constantly going up and down depending on thermal load and engine rpm. When the A/C hoses age and/or are oil soaked from an engine leak they become porous. When the system pressure reaches a point, the refrigerant then starts to push through the hose and into the atmosphere. The result is poor performance due to a lack of refrigerant but no visible sign of a leak. Keeping the engine clean goes a long way in preventing A/C hose failure. The system also employs many rubber-type O-ring seals that over time will leak slightly. If the machine is many years old it will inherently lose some refrigerant even though nothing is wrong. When this occurs moisture is introduced and mixes with the refrigerant and creates acid. It then deteriorates all of the internal components. You are now faced with a repair bill in the thousands of dollars. But this does not have to be the case. Every few years the A/C system is meant to be discharged (refrigerant removed), evacuated (a vacuum introduced to boil off moisture), and refilled with the proper amount of fresh refrigerant and oil. Sadly, few do this. If they did the A/C would outlast the machine and freeze them out. It does require a dedicated tool that is quite costly so it is prudent to schedule the procedure with your dealer.